The Nintendo Switch may be riding high with the announcement of new Pokémon games, but that doesn't mean Nintendo has forgotten about its other stalwart handheld line. It's announced an all-new version of its Nintendo 2DS XL console that, while no different in terms of its internal specifications, is a feast for the eyes on the outside. 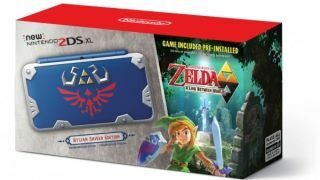 The Zelda-themed edition is designed to look like the hero Link's iconic Hyrulian shield. From the looks of the promotional shots that Nintendo has shared, it'll feature a neat raised detailing design befitting of the legendary weapon, rather than the smooth exterior other 2DS XL special editions make do with. In addition, the fantastic Legend of Zelda: A Link Between Worlds game, a semi-sequel to the SNES classic A Link to the Past, will come pre-installed on the console. As it stands, the console variant is an exclusive for US retailer GameStop, priced at $159.99 (putting the pre-installed game at just a mere $10 other the cost of a regular 2DS XL) and coming to stores on July 2. But Nintendo has been known to share the love to other local retailers around the globe, so don't be surprised if this turns up at your local gaming emporium before long. And if not, there's always eBay, right? New Nintendo 2DS XL: Nintendo's oft-revised handheld perfected?